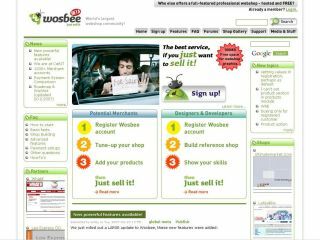 Wosbee includes a forum where users can exchange ideas and experiences on how to run an online shop. Thanks to Wosbee.com , anyone can now open a secure webshop for free. The service is to be fully unveiled at the CeBIT show in Hannover this week. Wosbee is a free e-commerce service mainly aimed at small and medium-sized businesses. It includes secure hosting, and supports all major payment systems including PayPal , Google Checkout , Ogone , DIBS/DebiTech , Chronopay , and ClickandBuy . The service includes common e-commerce features such as template-based layouts, a product catalogue, search engine optimisation (SEO), shopping basket functions and secure order management. There is also a forum where users can exchange ideas and experiences on running an online shop. Created by Smilehouse , a Finnish e-commerce software vendor, Wosbee is free to use and there is no hosting or transaction charges.